Urban space is valuable real estate and too much of it is underused. 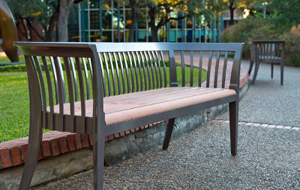 UrbanEdge is an exclusive Landscape Forms, Inc. collection of landscape framing and furniture elements designed specifically to help designers make more effective use of under utilized space. Created in collaboration with award-winning landscape architects Gustafson Guthrie Nichol (GGN,) the collection looks at the urban fabric with a fresh eye. Informal, dynamic site elements including bar height rails, stools that swivel, and planters that also serve as seats, define edges, activate corners, create niches and furnish lively outdoor settings that leverage available space and create a sense of place. A Sense of Place...You know it when you feel it. For more than 40 years Landscape Forms has been producing site furniture and accessories that help designers and other clients create a sense of place in outdoor environments. We do it through integrated product collections, leading edge technology and great design. We partner with international designers to create exceptional products, we nurture our own people to high achievement, and we operate our business at a standard that has earned customer loyalty and leadership in our industry. Our secret is simple: Design, Culture, Craft drive everything we do.